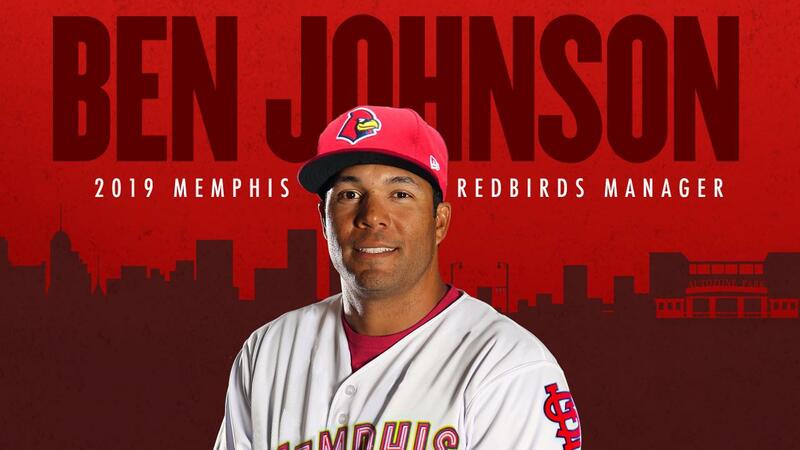 MEMPHIS, Tennessee - Memphis native and former St. Louis Cardinals minor league outfielder Ben Johnson will manage the Memphis Redbirds during the 2019 season, the Cardinals announced Friday. Johnson made his Major League debut with San Diego on June 26, 2005, and he went on to appear in 31 games with the Padres that year. He played 58 games with San Diego in 2006, before being traded to the New York Mets in the offseason and playing nine games in The Big Apple in 2007. Johnson's 10-year Minor League playing career spanned 901 games, where he hit .262 with 187 doubles, 115 home runs, 473 RBI, and 91 stolen bases. Johnson's Redbirds coaching staff for 2019 includes returning pitching coach Dernier Orozco, whose Redbirds pitching staff set a franchise record for ERA in 2018, and new hitting coach Jobel Jimenez, who spent the last three seasons with Double-A Springfield. The returning athletic trainer is Matt Corvo, and the new strength and conditioning coach is Frank Witkowski.